Maria Anna arrived at the Imperial court in Vienna with the Spanish fashion, theatre, dance and music (including the first sounded guitar). As the wife of the heir, she maintained good relations with all the members of her husband's family; however, she had a complicated relationship with Ferdinand's stepmother, the Empress Dowager Eleonora Gonzaga, mainly because between both began a competition for influence at the Imperial court. Maria Anna also paid much attention to the arts, especially painting. She collected works of Italian, Spanish and Flemish painters of the late Renaissance and early Baroque. In Regensburg on 22 December 1636 Ferdinand was elected as King of the Romans, and a week later he was crowned by the Archbishop of Mainz. Maria Anna was crowned Queen of Germany one month later, on 21 January 1637. After his father's death on 15 February 1637, Ferdinand became Holy Roman Emperor under the regnal name of Ferdinand III and also became sovereign King of Hungary and Bohemia. As his wife, she received the titles of Holy Roman Empress and sovereign Queen. Her coronation as Queen of Hungary took place in Pressburg during the Hungarian Diet of 1637–1638. 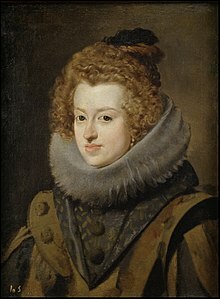 Maria Anna, being active in politics as the adviser of her spouse, was an important mediator between the Emperor and their Spanish relatives. 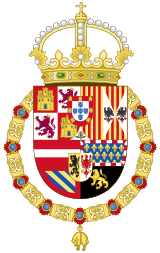 Despite the fact that she always defended the interests of her husband, she did not forget the interests of her brothers King Philip IV and the Cardinal-Infante. In her court, which was consisted mainly of Spaniards, frequent guests were the Spanish ambassador and diplomats. The Emperor, during his absences from the Imperial court in Vienna, appointed his wife as regent, for example in 1645 during the Thirty Years' War, when he was in the Kingdom of Bohemia. A 1630 portrait of Maria Ana by Felipe Diriksen hangs in the Portland Art Museum, Portland, Oregon. ^ Wurzbach, Constantin, von, ed. (1861). "Habsburg, Maria Anna von Spanien" . Biographisches Lexikon des Kaiserthums Oesterreich [Biographical Encyclopedia of the Austrian Empire] (in German). 7. p. 23 – via Wikisource.